This is worth checking out. Hat tip to Poliblog. Tim Conway and Harvey Korman Predicted the TSA in the 1970s! I guess I've been remiss in keeping up with the news; Harvey Korman passed away this Thursday, and I found out this morning. If you're not familiar with his work, you don't know what you're missing -- his work on The Carol Burnett Show (especially with Tim Conway), his role as Count de Monet in "History of the World, Part I," his scene-stealing greatness as Hedley Lamarr in "Blazing Saddles," and so much more... thanks, Harvey. 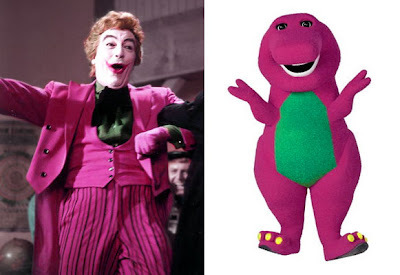 I know Heath Ledger is all the rage right now, but a friend and I just noticed the similarity in wardrobe between the Cesar Romero "Joker" of the 1960s and everyone's favorite purple dinosaur. H.L. Mencken, (1880-1956), writer, journalist. "A laudable disposition to open-mindedness decayed, in the late twentieth century, in America, into an inability to arrive at conclusions." Yes, David Mamet. Yes, the "Glengarry Glen Ross" guy. The quote is from The Wicked Son, and it's a great read for all members of the tribe (and you know who you are). Should I be so bothered by the fact that Steve Cooley's statement in the ballot for this June's Democratic primary includes a testimonial from novelist James Ellroy? To wit, "Cooley focuses attention on cold cases and DNA." I'm sure Ellroy is a smart guy, but is a cop novelist really the best Cooley can do? 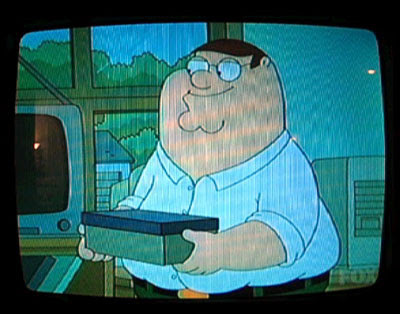 Wish I had a picture to share with you. This evening at Souplantation I was treated to the site of a late-teen wearing a death metal t-shirt featuring the word "cannibal" in large, dripping letters... while he chowed down on a nice iceberg lettuce salad. Tonight there was a great sequence that I had to share with a friend, and this seemed like the best way; so please enjoy the accidental largesse therefore laid at at your feet. Exxon Mobil yesterday announced its financial results for the last quarter. Analysts and investors are up in arms about it. They're unhappy. The company's unhappy. Consumer activists are unhappy (for different reasons). Exxon made ONLY $10.9 billion in PROFIT.